If I could choose to be anyone from the twentieth century, I would not hesitate for a moment to pick Ernst Jünger. The man did just about everything it was possible to do in his time, and stretched the limits of what one individual can accomplish in a lifetime to their breaking point. His incredible lifespan alone (he died a month shy of his 103rd birthday) spanned the Kaiserreich, the German Revolution, the Weimar Republic, the Third Reich, the Federal Republic of Germany, and finally, reunited Germany in his final decade – and was active in all of them. As such, his life itself can be seen as a symbol of Germany in the twentieth century, albeit he remained unconventional throughout all of its phases. Although Jünger is commonly perceived as having been something of a Prussian aristocrat, he was in fact born into a middle-class family in Heidelberg, Baden-Württemberg. Jünger was quite physically active as a youth, and developed a passion for reading and writing early on. In 1913 he ran away from home in order to join the French Foreign Legion and made it to Algeria, but was dismissed from the service after only six weeks after the German Foreign Office (acting on behalf of his father) informed the Legionary authorities that Jünger was underage. Jünger did not have to wait long to realize his dream of becoming a soldier, however, with the outbreak of the First World War the following summer. On August 1, 1914, the day Germany declared war, Jünger volunteered for the 73rd Infantry Regiment of the Hannoverian 19th Division. After receiving his training, he was sent to the front in France in December. Jünger saw combat throughout the remainder of the war, being wounded fourteen times, and he was decorated with the Iron Cross First Class as well as the Prussian Pour le Mérite. After the war, he wrote a series of books based on his experiences, most famously Storm of Steel , the book for which he is still best-known in the Anglophone world, and which was closely based on the diaries he had kept during the conflict. Jünger’s take on war was unconventional in that, unlike other writers of the war, he rejected pacifism, emphasizing the life-affirming, adventurous, and almost mystical qualities of the experience of industrialized trench warfare. This is not to say that he celebrated war, as he certainly did not eschew the unpleasant or ugly aspects of combat, but Jünger adopted a Nietzschean, amoral approach which viewed modern warfare as an opportunity for personal growth and transcendence. Also missing from Storm of Steel was any biographical or political approach; one would learn very little about the politics or strategies of the war from reading it, and even less about Jünger’s life prior to the war. The early drafts of the book contained a number of passages celebrating German nationalism, but Jünger, who revised the book many times in later years, would soon come to remove them from future editions, keeping the focus solely on the experience of the war as seen by the front-line soldier. Jünger’s war books became bestsellers during the Weimar period and especially later, during the Third Reich. In the 1920s they secured his veneration by German nationalist circles, including the fledgling National Socialist Party. 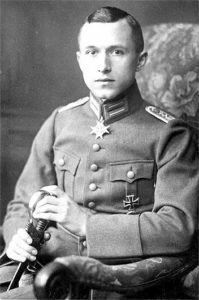 Jünger remained as an officer (Lieutenant) in the German Army until 1923, however, and as such refrained from participating in politics, and later recorded how during this period he struggled with drug addiction as a result of the physical and psychic wounds he had suffered in the war (a problem he soon overcame). Upon leaving the Army, he briefly participated in the nationalist Freikorps, but left quite soon, by his own account because he found the people in it to be of generally low character, who frequently asked to borrow money from him. It was to the circle known as the “Conservative Revolutionaries” that Jünger was most closely associated, however: those thinkers who were not merely engaged in the polemical struggles of the day, but who were reevaluating politics – indeed, all aspects of the modern world, including the very nature of society itself – at its most fundamental level, rejecting not only liberal democracy but also Communism, seeking a new synthesis of Germany’s aristocratic, hierarchical traditions with socialism. It was a monumental project which perhaps has no precedent in the West since the ancient Greeks. This circle included Oswald Spengler and Arthur Moeller van den Bruck, and influenced Martin Heidegger and Julius Evola, among many others. Like many of the Conservative Revolutionaries, Jünger freely mixed with both the radical Right and Left, and was as interested in the activities of the German Communists and anarchists as he was in the nationalists. Jünger was especially close to Ernst Niekisch, who was the leader of the current known as the “National Bolsheviks,” which sought to combine nationalism with the best elements of Communism, and Jünger was a frequent contributor to Niekisch’s newspaper, Widerstand (Resistance). Many years later, he was to remark that if Niekisch had become the leader of Germany in the 1930s instead of Hitler, that the history of Germany in the twentieth century would have taken an entirely different, and more successful, course. In 1932, Jünger published what is still seen as his most important philosophical work: Der Arbeiter (The Worker – no English translation currently exists, although one has been announced by Northwestern University Press for later this year), which outlined the type of civilization he imagined for the future (more on this later). It was also during this year that he published his last nationalist writings, adopting an apolitical attitude from that point forward. He greeted Hitler and his Party’s rise to power without enthusiasm. He turned down all offers of official posts from them, refused to allow his writings to appear in official Nazi publications, and would not appear on Nazi radio broadcasts. Jünger largely withdrew from public life, although he continued to write and publish, and his early war books were celebrated more than ever before. In 1939, he published the novel On the Marble Cliffs , which is a thinly-veiled allegory about totalitarianism, depicting a pastoral community of traditional, aristocratic people destroyed by a ruthless dictator known as the Head Forester. Whether the novel was intended as an allegory for Nazism or for Communism, or both, is still debated. Surprisingly, the book was never banned, and Jünger was not blacklisted for publishing it, likely due to the high regard in which he was held by Hitler personally because of his war record and war books. In spite of his antipathy for the Nazis, however, Jünger was nonetheless recalled to the German Army shortly before the Second World War broke out and was given the rank of Captain, which he willingly accepted. He was assigned the command of the 2nd Company of the 287th Regiment of the Wehrmacht, and participated in the invasion of France in 1940, winning himself another Iron Cross. Jünger saw little combat for the remainder of the war, however, and was instead assigned as an officer of the occupation in Paris. One of his duties was censoring letters; he later claimed to have saved the lives of several people by destroying letters that he knew would have run them afoul of the authorities. Apart from this, he spent most of his time visiting bookshops in Paris and spending time with artists and writers such as Pablo Picasso and Jean Cocteau. He also kept a series of diaries during this period (as yet untranslated) which are regarded as being among his greatest works. Like many of the senior officers of the Wehrmacht, however, Jünger was fearful for the fate of Germany when the fortunes of the war took a turn for the worse, and he was an inspiration to many of those who took part in Claus von Stauffenberg’s plot against Hitler in July 1944. Jünger had been in contact with many of the plotters (including Erwin Rommel), circulating a secret document entitled The Peace, which was a blueprint for a new post-war and post-Nazi order for Europe. Although Jünger’s peripheral role in the conspiracy was known to the Nazis, he only suffered dismissal from the Wehrmacht, and no additional punishment – again, likely due to the high esteem in which he was held by the Nazi leadership and by the German public in general. Jünger’s son, Ernst Jr., a naval cadet, was arrested the same year for allegedly holding subversive talks, and he was sentenced to serve in a Wehrmacht penal unit, and was killed in action in Italy in November 1944. After the war, Jünger found himself in the unenviable position that all of the survivors of the Conservative Revolution were thrown into: although he had never been a National Socialist, and in fact had resisted them to some degree, he had nevertheless been a well-known figure of the Right and had contributed to the milieu which had allowed the Nazis to rise to power, not to mention his Wehrmacht service. As such, he was still regarded with suspicion by the Allies, and in 1945 the British authorities banned him from publishing for four years. Although he was to continue to write and publish for many decades thereafter, the dark cloud which hangs over all those who have refused to toe the line of the wonders of liberalism and democracy continued to follow Jünger for the rest of his life, and indeed, still overshadows his legacy to this day. In 1951, Jünger embarked on yet another, much more unorthodox, adventure: he was one of the first people to take LSD. Albert Hofmann, the Swiss chemist who originally synthesized LSD by accident while attempting to develop an anaesthetic for women in childbirth, had been a long-time admirer of Jünger’s books, and after undergoing the psychedelic experience himself, he felt that his only precedent for it was certain lyrical descriptions of mystical states in Jünger’s novels. As such (Hofmann recounts the story in his book LSD: My Problem Child ), he contacted Jünger and asked him if he was interested in trying it. Jünger, who had already sampled a wide variety of drugs in earlier life, eagerly accepted, and in 1951 Hofmann showed up at his home, where the two took it together (under medical supervision). Jünger was quite fascinated by the experience, which he wrote about in fictional form in his novella, Visit to Godenholm , recently translated into English by Annabel Lee for Edda Publishing in Sweden. Hofmann and Jünger continued to trip together occasionally for many years afterwards, apparently well into Jünger’s 90s (Hofmann likewise lived to age 102, passing away in 2008). Jünger writes about all of his drug experiences in his as-yet-untranslated book, Annäherungen. In spite of the continuing controversy regarding his involvement with the Right, Jünger nevertheless became a literary celebrity in post-war West Germany, as well as in France, where most of his work has been translated, and he won many literary prizes across Europe. He likewise travelled the world, and is said to have visited every continent except Antarctica. His stature was such that in 1984, when Germany and France held a ceremony of reconciliation at Verdun, the site of one of the great battles of the First World War, Jünger was asked to act as a mediator between German Chancellor Helmut Kohl and French President François Mitterrand, the latter of whom was a professed admirer of Jünger’s work. Jünger continued to be productive into his old age, publishing dozens of books – works of fiction, including books that could fairly be called science fiction, as well as non-fiction on a wide variety of topics (the final edition of his Collected Works consists of twenty-two volumes) – and many more essays, the last of which was published only weeks before his death in 1998. The question that is probably in the minds of many Counter-Currents readers is, was Jünger still a man of the Right after 1932? There is no easy answer. Julius Evola, who praised Jünger’s Weimar-era work and published a book on Der Arbeiter in 1960, nevertheless regarded Jünger as a traitor for going back on his oath of loyalty by participating (however peripherally) in the plot against Hitler in 1944, and saw him as selling out to the liberal values of the new Republic in the post-war years. As for the first accusation, while it cannot be denied, one must take into account the circumstances of the time. By 1944, Germany was facing certain defeat, and Hitler’s announced policy of total war and fighting to the last man was already leading to the complete devastation of the country. Also, most of the leaders of the Stauffenberg plot were Prussian aristocrats who had no intention of allowing Germany to become a liberal Anglo-American colony in the aftermath of their success. Rather, their intention was to insist on an independent Germany which would side with the Western allies in a continuing struggle against the Soviets – but they made it clear that they would not countenance the wholesale surrender of the country. Jünger’s desire to see Hitler overthrown could therefore be seen as a form of loyalty to his people, even if he was expressing disloyalty to its leaders. As for the second, I think it is unjustified. While Jünger clearly softened in his later years (he would refer to his early works as his “Old Testament” – but he never disavowed any of them), it is clear to see even in his post-war writings that he was far from a liberal democrat. Jünger always remained an elitist who sought to stand apart from the crowd, and expressed horror at the dehumanizing effects of the ever-accelerating modern world (as he had predicted in Der Arbeiter). In his later decades, if anything, Jünger could be fairly described as an anarchist – not of the form one associates with the antifa and street demonstrations, but rather in believing that the modern state has become a prison for the individual, and that only by standing aloof from it and living on one’s own terms, and according to values of one’s own making, can one hope to attain any genuine freedom in a world dominated by bureaucrats with incredible and unprecedented forces at their disposal. But there is also some evidence that Jünger never really lost his interest in the Right. For example, Alain de Benoist, the founder of the French New Right, has related  how he was at a stand at a book festival in Nice in 1977 when Ernst Jünger unexpectedly approached him, striking up a conversation. As Benoist tells it, Jünger was very much interested in the activities of his GRECE organization, and the two continued to correspond until Jünger’s death. This is significant, given that the New Right is very much a continuation of the efforts of the German Conservative Revolutionaries. Also, as I learned in Lennart Svennson’s book about Jünger , the German Right-wing journal Junge Freiheit , which has been published weekly since 1986, revealed after his passing that he had been a long-time subscriber. According to one of their writers, Thorsten Thaler, Jünger always took the latest issue with him on his travels, praising the journal for taking an unconventional stance between mainstream conservatism and the radical Right. So in spite of the fact that he refrained from commenting on politics directly, it seems that Jünger never truly turned his back on it. It would be impossible to summarize all of Jünger’s literary work in an essay of this size, but there are three works which seem to epitomize the archetypal periods of his thought. The first is Der Arbeiter from 1932, which marked the culmination of his nationalist period. He did not use the concept of “the Worker” in a Marxist, classist sense, but rather as an archetype: the Worker is man engaged in any sort of productive or creative endeavor. Jünger believed that the industrial processes which had shaped and supported the impersonal killing fields of the First World War were soon to be implemented across the world, in all fields, and that the individual was doomed to be swallowed up in the processes of collectivization. For Jünger, this would be a world dominated entirely by impersonal forces in which all traditional values would be destroyed in favor of the value of material goods: mass production and consumption. In short, it would be a world made up of nothing but numbers. However, Jünger did see a possible upside to this disturbing vision: he also predicted the rise of a new race of Worker-Titans, Faustian men who would use these new powers as a means of achieving superhuman aims. Humanity as we know it would be destroyed, but the Titans of the future might give rise to something new and more powerful, attaining god-like status. In 1951, Jünger published The Forest Passage , and this is very much the reflections of a man who has lived through the horrors of the World Wars, and who now sees his homeland divided and occupied between the forces of liberal democracy on one side and totalitarian Communism on the other, which are not only imprisoning the individuals under their rule but threaten to unleash apocalyptic destruction at any moment. Jünger no longer talks of the superhuman potential of the Titans to make use of these forces. Rather, he speaks of the “forest rebel,” he who flees into the forest (symbolically), like a guerrilla fighter, to escape the ravages of the modern world and the forces of authoritarianism which seek to dominate and control him (already in this book, Jünger claims that America is “nearing perfection” in this technique through the use of radio and television). The forest rebel is one who withdraws from participating in this inhuman society as much as possible, living according to his own rules, but who seeks to undermine society by performing acts of resistance (even if these are doomed to failure), or through personal disciplines and religious practices. Jünger also calls upon the Germanic tradition of the home as one’s sanctuary: one’s home is a place of freedom, he writes, not because that freedom is guaranteed by law, which can betray you, but rather because one is prepared to fight anyone who tries to violate that space. Whatever one thinks of Jünger’s life and work, it is undeniable that he was one of the most prominent members of an increasingly rare breed – that of geniuses who make important strides in many different fields simultaneously, and who make a brilliant work of art out of their own lives, both in terms of what they do as well as how they live it. In our age of small men who are encouraged to never grow up and to keep their ambitions low, Jünger is a towering figure from the Age of Titans, a man who dared to live life on his own terms and contributed to transforming the world around him in the process. While a great deal of Jünger’s work is available in nearly every other European language, for some reason his books, apart from Storm of Steel, have never caught on in the Anglophone world, and only a small portion of his body of work has been published in English. Fortunately, Telos Press has been making an effort to remedy this situation, and in recent years has issued a number of his works in translation. An excellent introduction to Jünger’s life and ideas is the film 102 Years in the Heart of Europe , which consists of an interview with him that was shot by a Swedish crew only a year before his death interspersed with narration.